Festive Makers Market 12th December – Thank You! 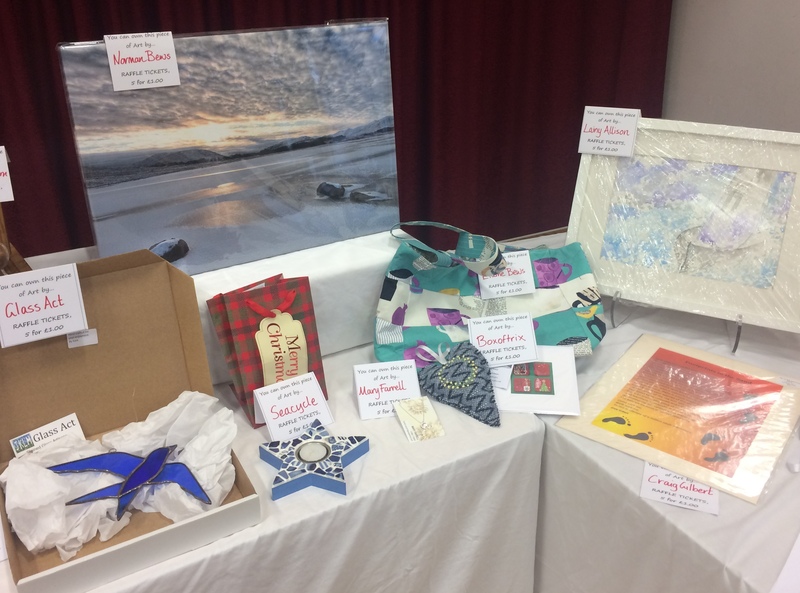 A great big thank you to everyone who visited our Festive Makers Market in Inverkeithing Civic Centre on Saturday 12th December. 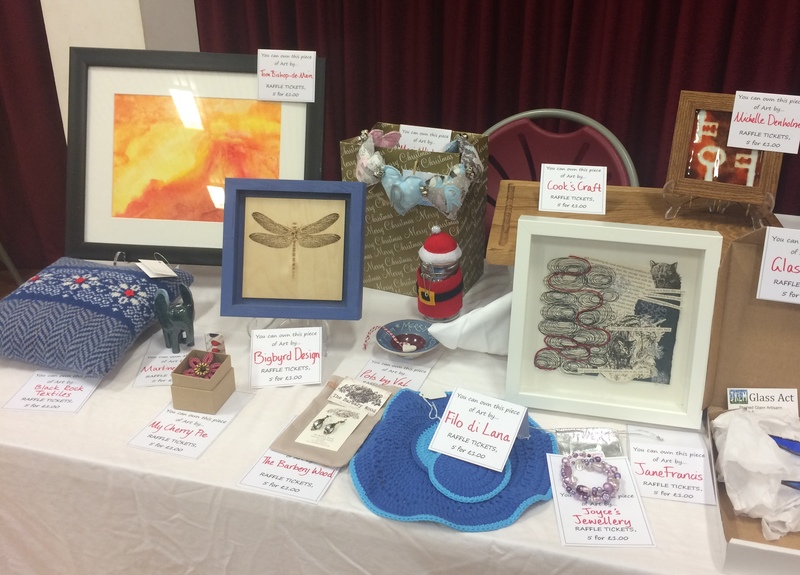 We hope you had lots of fun and enjoyed looking around at all of the beautiful art and crafts which filled the hall. Lots of unique hand made gifts will certainly be opened with much enjoyment this Christmas! We heard lots of compliments on the amazingly high standard of the work on show, and we totally agree. There was also a lot of conversations going on, between visitors and makers, and between the makers themselves, with some fascinating collaborations being discussed for the future! Thank you to all the lovely artists and makers: Tom Bishop-de-Main, Lainy Allison, My Cherry Pie, Maria Hickman, Craig and Caren Gilbert, The Barbary Wood, Pots by Val Burns, Glass Act, Seacycle, Bigbyrd Design, Joyce’s Jewellery, Boxofrix, Black Rock Textiles, Norman Bews Landscape Photography, Elaine Bews, Tubular, Karen Trotter, aisydaisy, Filo di Lana, Cook’s Craft and Martine Greig. And thank you all for your beautiful raffle prizes – the winners will all be thrilled to win an original work of art! Thanks also to Kate Walker the storyteller, and her apprentice Rowan Morrison, who engaged the children with so much wonder, laughter and magic, and worked so hard all afternoon. We can’t believe how much you put into your stories, rhymes and sangs, and your presence was very much appreciated. We do hope to collaborate with you both again in offering children and adults alike access to the magic of storytelling. Thanks also to The Scottish Book Trust for generously supplying us with lots of wonderful childrens’ books to give away to wee visitors, and to the Inverkeithing Library Service for having a stall filled with free book-related goodies and information about library services. Thanks to the Inverkeithing Food Group for collaborating with us once again with your festive foodie activities and helping to provide a day of fun activities in Inverkeithing – helping to show off our town to visitors and residents alike. Also, because you open up the beautiful medieval Friary to be used and enjoyed, it reminds everyone of its value for our community as a meeting space and as a heritage building to be treasured. And a very big thank you to our volunteers: Andrew, Adam, Sandy, Megan, Ollie, Isaac and Rosie for helping out with refreshments, the IAI information stall, the IAI art stall, and the children’s crafting activities. Thanks to Iwan of Matty and Vee Vintage for volunteering to take photographs of the day, and to Karen for selling Art Raffle tickets all week at The Millbrae Cafe – we couldn’t do it without you all! We’ll be posting the photographs taken by Iwan Thomas soon so watch this space! As always, you ran a professional, efficient, enjoyable Market. Thank you for all your hard work ladies! Many thanks Sam! It looks so great because the artists’ work is so fab! You’ll never guess who won your raffle prize – Morag Kelly, wife of David Kelly!!!! I phoned up tonight to tell them and found out he is the lovely man from whom you bought the clock. Isn’t that a totally weird coincidence? As always you ran a professional, efficient, enjoyable Market. Thanks for all your hard work ladies. Previous Previous post: The Inverkeithing Festive Makers Market is Nearly Here!